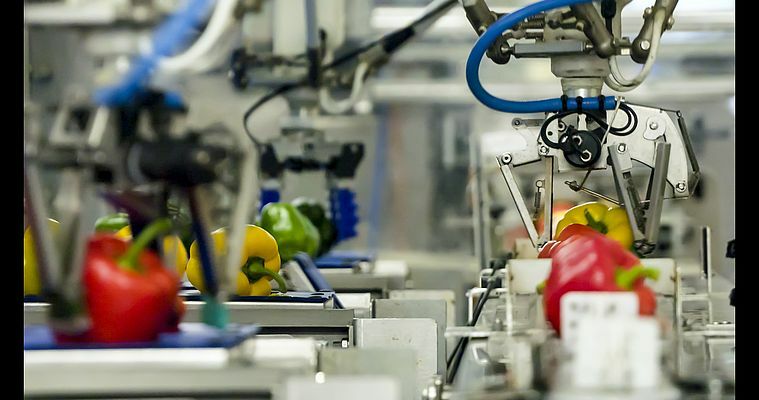 Combilo - a leading fruit and vegetables wholesaler in the Netherlands, recently installed a new robot-assisted packaging line and, overnight, increased productivity by 30%. The new packaging line includes delta robots and vision system from Omron and was built by the systems integrator EasyPack Technologies. Combilo specializes in the import, export, packing, storage, shipment, and distribution of fresh fruit and vegetables to retailers. One of the products it packages is the bell pepper “traffic light”, this is a packet containing one red, one yellow and one green bell pepper. Not surprisingly, this used to be slow and labour-intensive, but with the new robot-assisted packaging line Combilo can perform the traffic light packaging much more efficiently and with significantly fewer failures. But that is not all. After the bell peppers are weighed, the vision system—comprising three cameras—relays the position, the location of the bell peppers and the shape of the stem to the system. 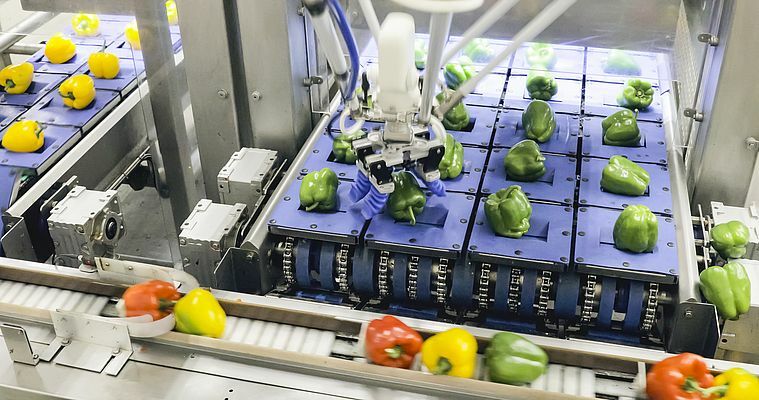 This then allows the system to calculate precisely how the bell pepper should be packaged and turned so that it can be placed in the correct position on the belt. According to Villerius, working with bell peppers is especially difficult because their shape varies so much. And their stems are also rigid, so they have to face inwards to avoid ripping the packaging. Two companies were involved in developing the automated packaging line. 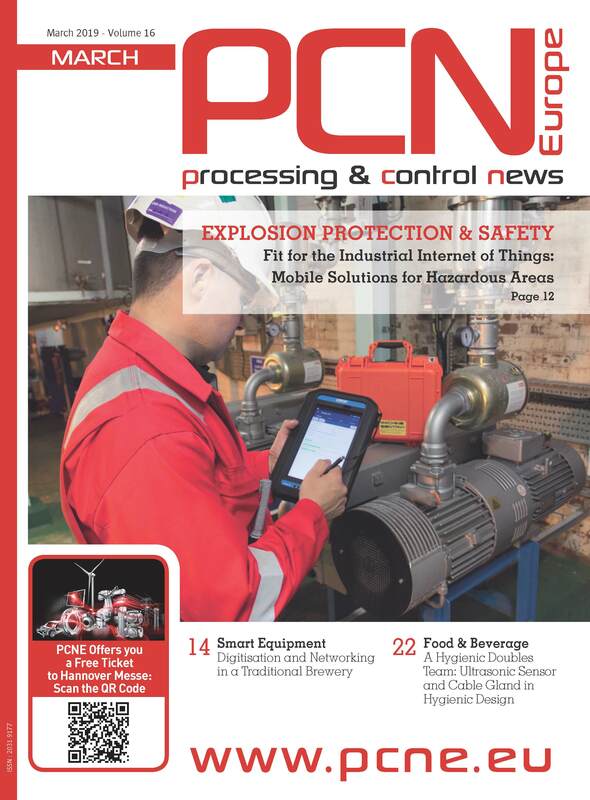 The contractor for the project was EasyPack Technologies; a young company that develops and builds packaging machines for the food industry EasyPack worked close with Rons Electronics Supplies, which is a regular partner that handled the electronics and controls. Virtually the entire control mechanism of the robot application—with the exception of the load cells and the weight converter—was supplied by Omron. Rons Electronics Supplies used the Sysmac Platform supplied by Omron to configure the installation. According to Director Ron Schinkel, this is an efficient and flexible way of programming how the machine is monitored and controlled. 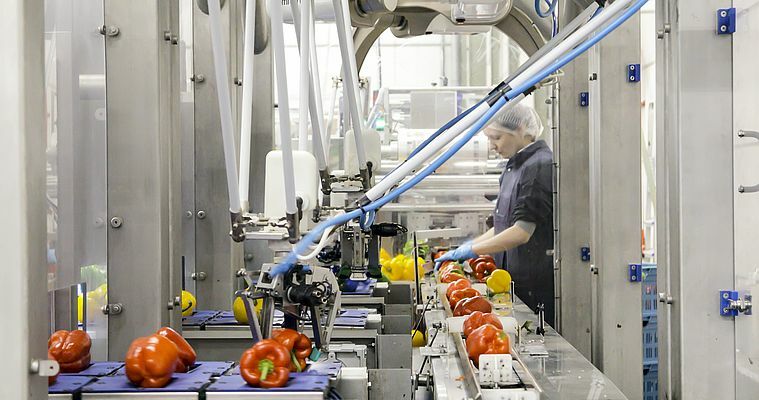 The robots and the packaging line are operated using a touchscreen that allows the operator to configure and control parameters such as weight, position, and belt speed through simple pictograms. The display also shows error messages. Villerius is happy with the new robot-assisted line. After a year of test runs and a few adjustments, the performance of the line is outstanding. The robots save on manpower, and the robot-assisted line provides a productivity that is 30% higher per FTE than a traditional line — a comforting fact in a time where it is becoming increasingly difficult to find personnel that are adequately suited to the job.